The Nigerian government has earmarked huge sums of money from 2018 budget in her unrelentless and futile bid to engage and defeat the activities of the Indigenous People of Biafra (IPOB). Following the Federal Executive Council's meeting held recently in Abuja, the Nigerian Federal Capital City, the information and Communications Minister - Alhaji Lai Mohammed, fielding questions from journalists at the end of the meeting, gave emphasis to this effect. The minister categorically stated that the Nigerian government has completed arrangements to consult some International media organisations such as CNN, BBC, Al-Jazeera, VOA amongst others, to contend with the veracity of the IPOB media which has to a great extent, destroyed the very fabrics of the country's corporate existence, through it's antecedents in keeping to the norms of professional journalism. 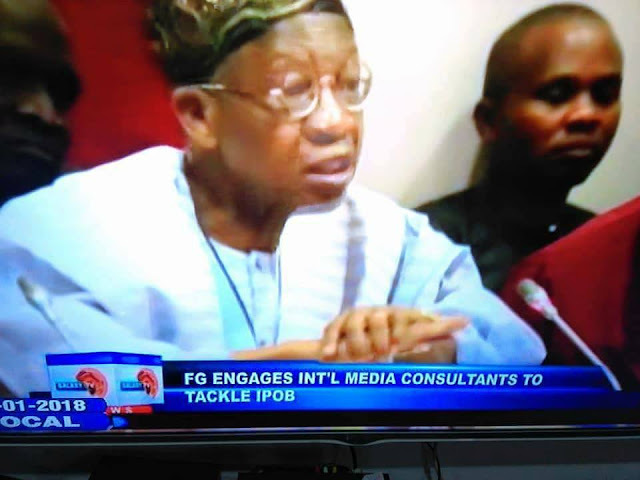 Alhaji Lai Mohammed went further to explain that world acclaimed media experts will be contracted to effectively respond to and truncate the IPOB media potency by all means possible. This demented information of upcoming colossal wastage of tax payers money to contract International media organisations against IPOB media, is a confirmation of a conscienceless government brokering a callous/immoral agreement when millions of overburdened and financially impoverished workers in Nigeria cannot be paid their salaries. The Indigenous people of Biafra (IPOB) worldwide, wholeheartedly welcomes this development. By this singular move, it becomes abundantly clear that the Nigerian media has been humbled and grossly reduced to shameful insignificance by the IPOB. The Nigerian brown-envelop journalists are now set to relinquish their professional responsibilities to foreign media experts and personnel to carry on with the dirty jobs of deceit and falsehood for the country. The credibility of professional journalism has been severely mortgaged in Nigeria for mundane interests of hirelings and slaves. The world's interest in Nigeria media outlets like NTA, AIT, Channels TV, Vanguard, Guardian, Sun, Punch Newspapers etc, have greatly been rubbished, thereby unconsciously empowering and promoting the Biafran media. Such Biafran media outlets like Radio Biafra London, Biafra TV, Family Writers Press and Biafra Herald website, have inadvertently become the toast and accurate news outlets in Africa and beyond. It is indisputably correct to assert that the dogged and professionally- inclined Biafran media has pushed the "almighty Nigerian media" into oblivion. This shamelessly prompted the government of Nigeria to boycott it's own and opt for the engagement of foreigners, principally in its bid to contain and perhaps defeat in their thinking, the Indigenous people of Biafra (IPOB). But true to mandate, the IPOB volunteer media warriors all over the world, are very much courageously kitted for the battle more than ever before. The Indigenous People of Biafra (IPOB) worldwide, under the supreme command of Mazi Nnamdi Kanu hereby welcome and warn the would-be foreign media contractors to tenaciously play by the rules of professional journalism and eschew peddling lies and deception against Biafra and her indigenous people, as the corrupt and evil government of Nigeria would definitely would want to get them entangled and teleguided. What a bizarre mode of governance in a supposed democracy! It is disheartening to state that in such a season as this, that the government is scouting for International media consultants to assist them to remodel and disseminate falsehood ought to have been a period of liaising with and engaging the global community on how best to organize referendum for the Biafran people. They are rather busy scheming for possible channels of wasting resources in unproductive ventures, all in their craving to smear the image of Biafrans and possibly sabotage the towering Biafra restoration efforts. The corruption syndrome is today by reason of this anomaly, being exported to the Western world by the Nigerian government as it strategizes in its frustration and desperation. It is indisputable to state here therefore before the world, that there is absolutely no place where lies and propaganda could be peddled against the Indigenous People of Biafra (IPOB), that will stand. It is a divine coverage. IPOB strongly and uncompromisingly stands for truth, freedom and justice and all the Biafra media teams, completely respect and uphold the principles of ethical journalism. Nigeria media, based on these antecedents, can never stand the challenge of ruggedness of the volunteer Biafra media warriors anywhere, anytime, any day. Let Nigeria empty her treasury for this looming "almighty media war" against the IPOB, and see Biafra stand tall and unscathed at the end of the struggle. Biafra must be fully and totally restored. It is imminent!